Needle Nook of La Jolla | NJNA is Blogging! 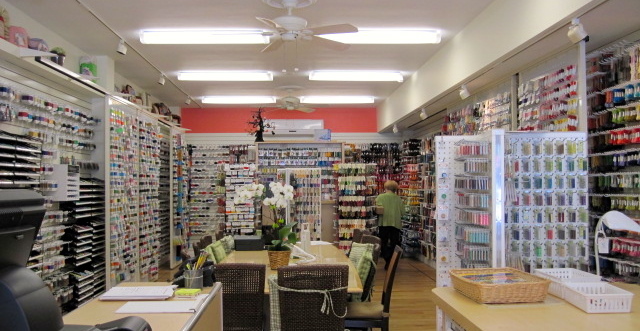 On Tuesday I went to La Jolla to check out the needlepoint shop called Needle Nook of La Jolla which is on Fay Street. I was able to park almost in front of the shop, a rarity as this is a busy shopping area. I went into a shop filled with beautiful canvases. It also had a collection of books and counted designs–I put my hands behind my back when I looked at the Kathy Rees designs–as well as accessories. I did buy a thimble thingy–just the end which you stick to the end of your finger–to use in one of my classes next week. I didn’t see any threads! When I asked, she said that the threads are in a separate shop two doors down. So as soon as I left I walked maybe 50 feet down to the second shop and saw two walls filled with threads all hanging in a beautiful display of color and texture. There were even sliding walls to see more threads behind them. It was overwhelming! Of course the project I wanted to kit was back at my motel which explains the second trip today. I came back with the fabric pieces I am using in the project and the threads needed. These are the wrong colors, of course, because my fabric was not holiday fabric. With the help of two lovely saleswomen, I made all my selections. It was a great experience. Just looking at all those colors and threads displayed so beautifully was refreshing! There website is http://www.needlenook.com and they are happy to do mail order! Tomorrow I leave by train for Anaheim where I will join Rosie at the seminar.